I recently received an Envitote for review, so I couldn't wait to go grocery shopping this weekend to see how many items I could fit in it! The first thing I noticed about this tote is that it has an adjustable strap that you can make either really long or short. I love that you can have it long and actually put it over your shoulder. 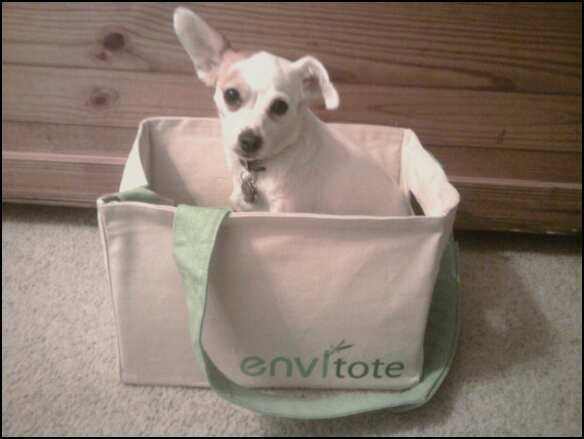 None of the other reusable bags I've ever tried had straps long enough to put on my shoulder, much less wear like a messenger bag like the Envitote! Dotty had to see if she could fit too! The second thing I noticed and love is that you can use this as a type of "crate" to carry rather than using the strap. This makes it very handy for a heavy load or fragile items. You can also take the bottom stiffener out of the bag and use it like a traditional reusable bag, or collapse the entire thing for travel. Another thing that I really like about the Envitote is that it's machine washable, which is great since I already got it a little dirty on my shopping trip! And this bag really holds a lot - More than you would think when you first look at it. I fit almost half of my groceries in it! 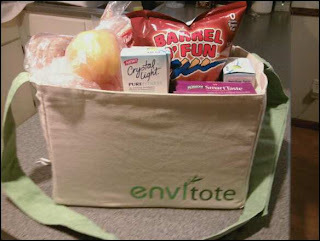 I think the Envitote is a great product and puts all other reusable bags to shame! I love that it is convertible to either a crate or a regular bag, and that I can adjust the strap to whatever length I want. It is stylish and cute too, plus it holds a lot. What more could you ask for? Buy It: You can purchase the Envitote online for $19.95, and as a special treat for my readers, you can enter coupon code FREE SHIPPING to receive free shipping on your order! 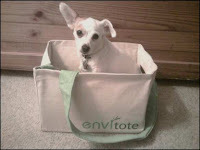 Win It: Enter here to win (1) Envitote from Envicorp! To Enter: Tell me how you would use the Envitote. Contest Details: Contest is open to residents of the US. Contest ends on August 19th at 11:59pm Central Time. Winner will be contacted by email and will have 48 hours to reply. In the event that they do not reply within the given timeframe, a new winner will be chosen. Disclaimer: I was given the Envitote free of charge for the purpose of this review. All opinions are my own experiences with the product. Individual results may vary. No other compensation was given. I found you over on my network over on Giveaway Blogs. In the Frugal Life group. I guess we're the newest ones there, doesn't seem to be too much activity on there. But glad I looked today! Great giveaway, I have entered by following you on Google Friend Connect! And I would use it for my shopping trips when I actually go into a brick and mortar store! LOL. I'm also following you on twitter now. i liked envicorp on facebook as well! I'd use it to store emergency supplies in my trunk. I would use it for grocery shopping! I would use it when I go to the farmers market on the weekend for veggies! This would be great to stand up all of my grocery stuff that I don't want to tip over. I would use this everywhere, but being I will be having a baby Sept 7, I can see this coming in handy in the car or just carryingthings back and forth. With three kids already I can promise this would be heavily used. I would use to to carry my library books! I hate how they bunch up at the bottom of a traditional bag. The crate style will make it easier! I would use it for grocery shopping. I would use it for groceries unless my daughter takes it for her use in her car. I follow Cheapskate4Life on Google Blogs. I liked Envicorp on Facebook. I am totally into reusable grocery bags right now. I also travel a lot for my job and I don't like eating out. I take my food with me if I am going to be in a hotel for more than 1 night. I absolutely love having a bag that is easy to pack and easy to see inside. So yes I NEED this product.